Hey all, I have a bit on an announcement to make. This is probably going to be a surprise to no one as I’ve mentioned or hinted this publicly a few times, but when I’m done building the world of Exploration Age, I’m going to put it out for everyone to enjoy. I’m still trying to determine a good price point for a PDF that has all of the world information a DM and players would need to get started. Essentially, I plan on releasing two products at first. One will be the campaign guide PDF that will include all the world info that’s public knowledge, and a few new tidbits of game information for your campaign (how much depends on the Wizards of the Coast OGL). 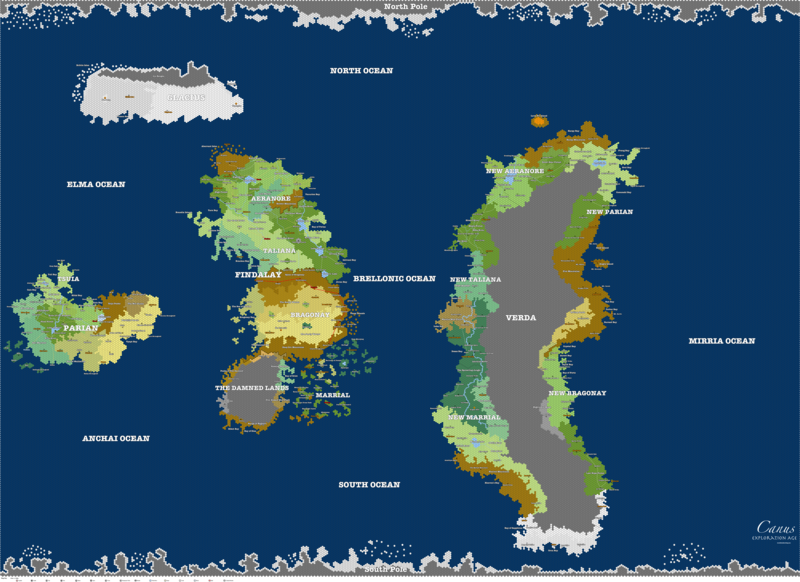 The second product would be a list of DM secrets of Exploration Age that would reveal some hidden plots and pull back the curtain on a lot of the map’s blank spots. Anyway, I really need your help. Let me know if this is something that would interest you as a consumer. Please take ten seconds and answer this poll about how much you would pay for a campaign guide PDF for Exploration Age. Please keep in mind the product would lack a lot of art, since I’m putting it out in my own. Also parts of the material would be taken from the blog posts that are already out there. As part of this announcement I’ve decided to give you a sneak peek at an excerpt from the Campaign Guide. Take a look! First up is an explanation of all the rumor entries this book will have (and you’ll notice this blog already has plenty in past posts). Then an explanation of the way time passes on Canus. I find it’s least confusing for folks to stick to around the same number of days and months per year as the real world calendar. Also I like the ten-day week from Forgotten Realms so I stole it! Thank you Ed Greenwood. Finally, here’s a bit about travel and a new and improved map of Canus after getting some feedback! Thanks for that. I’m listening so please keep commenting. Hopfully a little easier to read and you’ll notice larger poles and some errors corrected. “Canus is a world bigger than Earth. As a result getting from place to place can take some time. Luckily, there are all kinds of transportation that can help speed adventurers from quest to quest. Roads Parian and Findalay’s roads are lined with magic speedy cobblestones installed by The Arcane College. These roads allow for fast travel between towns and cities when using special swifty boots, swifty horseshoes, and swifty wheels. The speed of the traveler is tripled when using these items along the special roads. Travel along these roads is safe, thanks to the swift speed. If PCs are traveling quickly along the road at tripled speed, there is no need to roll for random encounters, until they stop to rest. Of course the GM may always have encounters on the road if he or she so chooses. Trails Certain terrain on the map is considered difficult terrain. Travelers move at half their speed through these areas which include jungle, forest, mountains, snow fields, frozen ocean, swamps, and marshes. Any travel along a trail through difficult terrain means travelers can move at normal speed. Rail Line Bragonay may not have speedy cobblestones, but they do have The Jackrabbit. This underground railway travels at a speed of 100 miles per hour and doesn’t need to stop to rest. This breakneck speed allows for safe, quick travel between cities and towns in Bragonay. Tunnels While not indicated on the map, all of Bragonay’s mountains and most areas of The Underdark are carved with tunnels. Tunnels allow for normal speed through mountainous and rocky areas, but every day spent underground traveling requires a successful DC 10 Wisdom (Survival) check. Failure of this check means travel in a random direction determined by the GM. A successful DC 10 Wisdom (Survival) can be made the next day to help get travelers back on track. This check may be made earlier if the travelers realize they are lost. Dwarves, drow, duergar, svirfneblin, and other underground-dwelling creatures cannot get lost underground. Boats Canus is full of oceans, rivers, and lakes. Various boats, seen in the equipment section can tell you their various speeds. Airships Airship travel is possible all over Parian and Findalay. There are airship docks in every above-ground city and town. Airships travel at an amazing 300 miles per hour and don’t need to stop and rest. However, every 3000 miles, an airship must stop for ten minutes and refuel. The refueling process requires a huge tower topped with a massive crystalline rod. The rods are then filled with arcane energy by mages once a year. All airships have an apparatus which allows them to connect to the rod and recharge. These towers have not been built on the sea, The Damned Lands, nor Verda yet, so airship travel is confined to the surface of Findalay and Parian. Mounts There are a variety of special mounts available in Exploration Age. See the equipment section for information about travel speeds. Certain mounts can ignore specific types of difficult terrain. Also I’d really like to take a quick moment to ask you to share this blog around with your tabletop gaming friends if you dig what’s happening in these posts. Thanks so much! I’d be curious to hear why the year starts with winter. Does that mean that the dead months are the beginning of the year? Is this because of some early necromancers, or some fascination with death by the early inhabitants of your world? Did they hope to stave off Death by having the new year born when the rest of the world seems to be dying? I know the pagan traditions behind our real-world (western) calendar, with the year beginning as light returns to the planet at the solstice, and then getting brighter with spring, adult through summer, old through fall, and eventually dying as the light fades, only to be rebirthed again. I’m curious to hear the reasoning behind your choice to begin with winter. I remember… I think it was Greyhawk… had an exceptionally long summer, which meant that nations could go to war more often and for longer, because they weren’t stopped by snow & cold. And I wonder if there are wizards/druids/peaceniks who ever fight against the weapon-based calendar names. Granted, they’ve been there forever, so maybe it’s not worth protesting (in the same way Christians today don’t bother protesting that many of our days and months are named after other gods of ancient times). I would argue that many, many people don’t even know what our days and months are named for, thus why would they protest against them? I like where you’re going with the winter thing. I like the convenience of it, personally, because then you don’t have to think as much to situate yourself into the world’s timeline. Would be neat to have an in-game reason though! True! Though thinking globally, the Southern hemisphere experiences WARMER conditions in the Winter. So dead months, etc. don’t necessarily make sense if I want to keep seasons hemispherically aligned with what happens on Earth. Though it may be simpler to keep things all one way over the world. Hmmmm…..